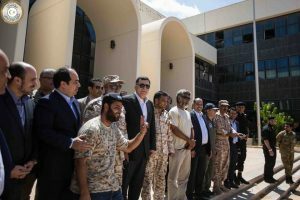 Even as Bunyan Marsous forces battled the remnants of IS in Sirte, Faeiz Serraj, head of the Presidency Council flew into the town and visited the Ougadougou Centre, once the terrorists’ headquarters. Serraj, along with other PC members, including his deputy Ahmed Maetig, from Misrata, spoke to senior commanders. In the past there has been resentment among BM fighters at what they considered to be the limited support in money and materiel that had been sent to them from Tripoli by Serraj’s government. If there were any recriminations today, they were not in evidence later as a smiling Serraj and his colleagues posed with fighters for photographers. He had said that the BM forces had proved to the world that the terror menace could be eradicated by Libyan efforts. The fighters had not just been defending their country, they had been defending the world. Serraj said that the men should be proud of themselves. He added that the battle against IS was a symbol of national unity and a national project involving everyone. He blessed the dead and prayed that the wounded would have a speedy recovery. The PC head had arrived at the Ghadabiya air base to the south of the town, which doubles as the civilian airport. Despite the potential risks of moving around while the battle for the last parts of Sirte continued, security surround Serraj and his colleagues was low and unobtrusive. The IS terrorists have now been pushed back to their very last position which is in Sirte’s Third District. One attempted car bombing using a vehicle with steel plate welded in front of it was stopped when anti-aircraft rounds penetrated the shield. The driver lay dead in the cab while BM forces unloaded the pickup truck’s cargo of shells and mortars. Footage has been published of another car bomb detonated hundreds of metres before it reached BM lines. The undated sequence shows a BM vehicle racing down the road while fighters look about a kilometre up the road behind it, where seconds later, there is a huge explosion. It is unclear if the suicide bomber was hit by ground fire or an air launched weapon. Though there is an eagerness to finish off a four-month fight that has cost more than 400 largely Misratan dead and 2,500 wounded there is a reluctance to take more casualties in what is clearly the final stage of a now uneven battle. The assumption is that IS is running out of ammunition and becoming militarily weaker. Yet Sunday’s suicide car bombing in which 35 were killed and dozens injured demonstrated the danger of a desperate enemy that has little inclination to surrender.